Suddenly at the start of The Times They Are A-Changin’ there’s a girl standing on stage. Blond, dressed in black, wearing a hat like it could have been a souvenir of the Rolling Thunder Revue. She wants to sing with Dylan. The bodyguard wants to take her away, but Dylan says it’s OK. They sing the first verse together. She sings great! Then Dylan steps back to play some guitar, probably expected her to leave, but she stays on stage. 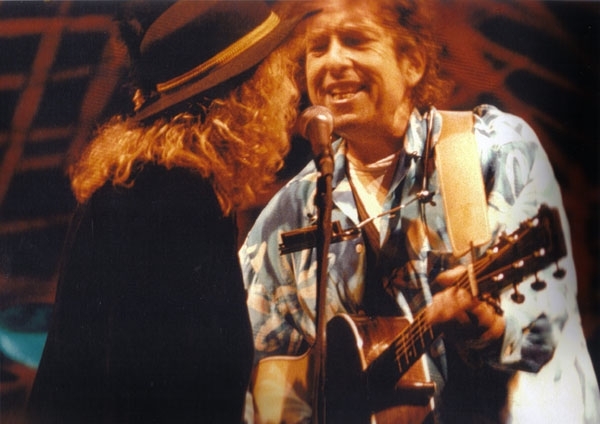 Dylan shows her his guitar as if he wants to say: “Maybe youwanna take this over as well?” Then the bodyguard again comes to take her away, but Dylan again says it’s OK. They sing the whole song together (and it sounds very good!) although Liz Souissi from Bern, Switzerland, is shaking all over, nervous as she is. All the time there are big cheers and lots of applause from the crowd. When the song is over, she starts to walk off stage, but then returns, giving Bob a big hug and kiss. This was front-page news in the local newspaper: “A Kiss for Swiss Liz”. Her comments: “This is what I always dreamed of. I almost didn’t dare, but still I took a chance on it. Of course I expected to be taken away immediately. To me this is the most beautiful thing I ever experienced.” And it was beautiful for many people in the crowd. Bob even smiled when all this happened.